Property prices in Abu Dhabi have decreased overall from H2 2017 to H1 2018, opening up numerous opportunities for both renters and buyers to upgrade their homes. Bayut’s H1 2018 Abu Dhabi market report shows that average asking prices of properties for rent and sale have continued to fall, allowing renters to negotiate to their advantage with landlords, and there is now more potential for first-time buyers in Abu Dhabi to enter the market. Even premium areas have become more affordable. Top areas for renting apartments in Abu Dhabi: Bayut’s H1 2018 market report. 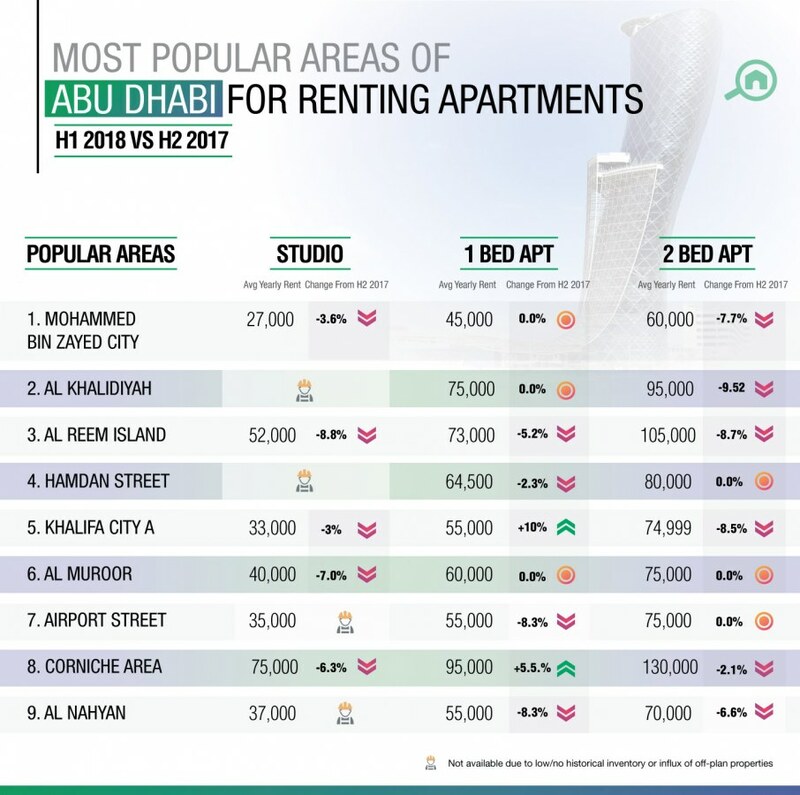 Mohammed bin Zayed City, an up and coming Abu Dhabi suburb, came out on top as the most searched area for apartment rentals in Abu Dhabi by users of Bayut. In terms of property prices in Abu Dhabi, the district has a reputation for being fairly pocket-friendly. The area is perhaps better known for villas, but apartments are also present in the district, giving residents access to a variety of high quality and spacious homes, from compact studios right up to roomy 4-bedroom units. In common with many other areas across the emirate, Mohammed bin Zayed City has seen prices fall from H2 2017 to H1 2018, making it an ideal place for tenants to take advantage of the lower prices and make their move to the area. One of the things that may have made the apartments in MBZ City, as it is affectionately known, popular, is its extremely reasonable rents. Studios in the area rented for an average price of AED 27k per annum in H1 2018. The average price of a 1-bed was AED 45k, and 2-bedroom apartments fell by 7.69% to an average price of AED 60k. Other popular areas for renting apartments in Abu Dhabi include Al Khalidiyah, Al Reem Island, Hamdan Street, Khalifa City A, Al Muroor, Airport Street, Corniche Area and Al Nahyan. Al Khalidiya came out as the second most popular area for those looking to rent apartments in Abu Dhabi. 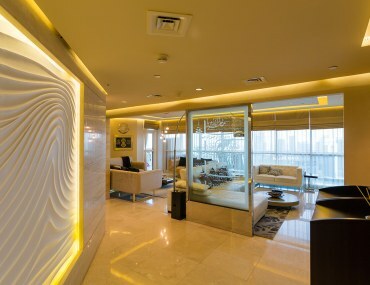 Within Al Khalidiya, the most popular place to rent was Al Waha Tower, followed by Khalidiya Village. The price for a 1-bedroom apartment for rent in Al Khalidiya averaged at AED 75k, while the cost of a 2-bed apartment fell by 9.52% to AED 95k. H1 2018 Abu Dhabi market report, most popular buildings in Al Khalidiya. Within Al Khalidiya, Al Waha Tower was the most popular building for apartment rentals, with current Bayut listings suggesting that prices for a 3-bed unit are around AED 125k. Next on our exploration of property prices in Abu Dhabi in H1 2018 is the most popular areas to buy apartments in Abu Dhabi. The most popular area was predictably Al Reem Island. There were mostly modest falls in Al Reem, with decreases of 3.12% for a 2-bed apartment, taking the average price to AED 1.55M. For a 1-bed, the average price fell by 6.67% to AED 980k. The next popular area was Al Ghadeer, favoured by many for its ideal location between Dubai and Abu Dhabi. The average price to buy a studio here is AED 465k, 1-bedroom apartments go for AED 650k and 2-bedroom flats for AED 875k. The area with the highest potential for investors was Al Reef, where the prices for studios, 1-beds and 2-beds all averaged at below AED 1M. Studios in Al Reef stand at AED 600k after a 10.45% decrease. Al Reef is a popular area for families, home to both villas and apartments. It often hits the top spot for people looking to buy villas, and was sixth on the list in terms of popularity for those looking to buy apartments according to our H1 2018 data. In general, prices for apartment sales fell across Abu Dhabi, with Al Raha Beach, Masdar City, Yas Island and Saadiyat Island making up the remainder of the list of most popular areas to buy apartments in Abu Dhabi. 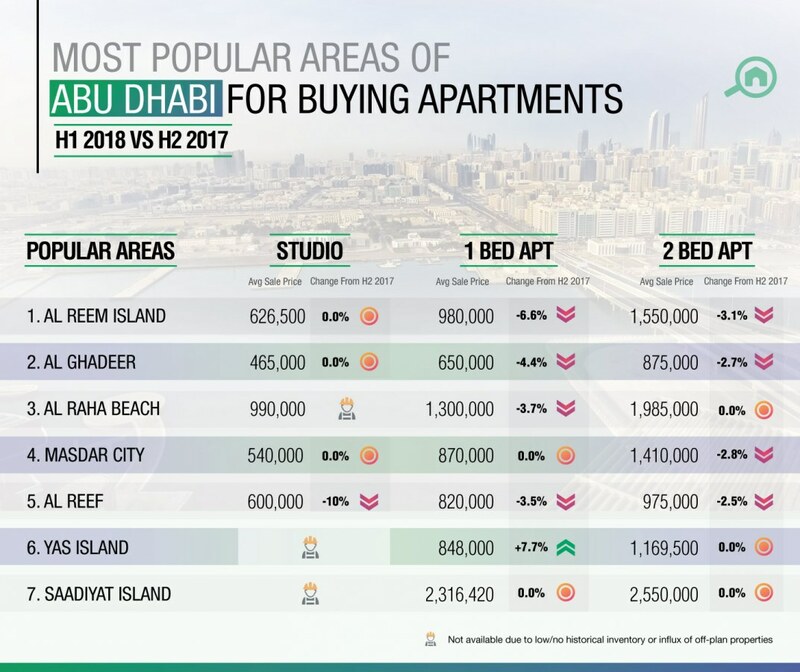 Al Reem Island was the most popular area for buying apartments in Abu Dhabi in H1 2018: Bayut market report. 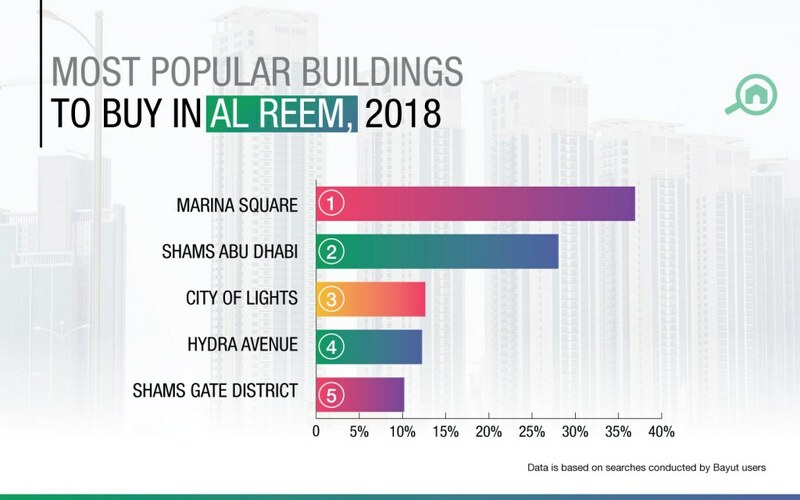 H1 2018 Abu Dhabi market report: The most popular buildings to buy apartments in Al Reem. Al Reem Island, home to iconic developments including The Gate Towers, appeared to the clear favourite for H1 of 2018. Al Reem is an area popular with professionals and young couples, thanks to its vibrant sense of community and stunning architecture. The area is also home to the Abu Dhabi branch of the prestigious Paris-Sorbonne university. Home to luxury high-end buildings, it makes sense to take advantage of lower prices to make an investment in Reem Island now before prices shoot up. The most popular building to buy in Al Reem Island appeared to be Marina Square, where studios start for as low as AED 393k. The other popular buildings in Al Reem Island include Shams Abu Dhabi, City of Lights, Hydra Avenue and Shams Gate District. Khalifa City A was the most popular for those looking to rent villas: Bayut’s H1 2018 market report. 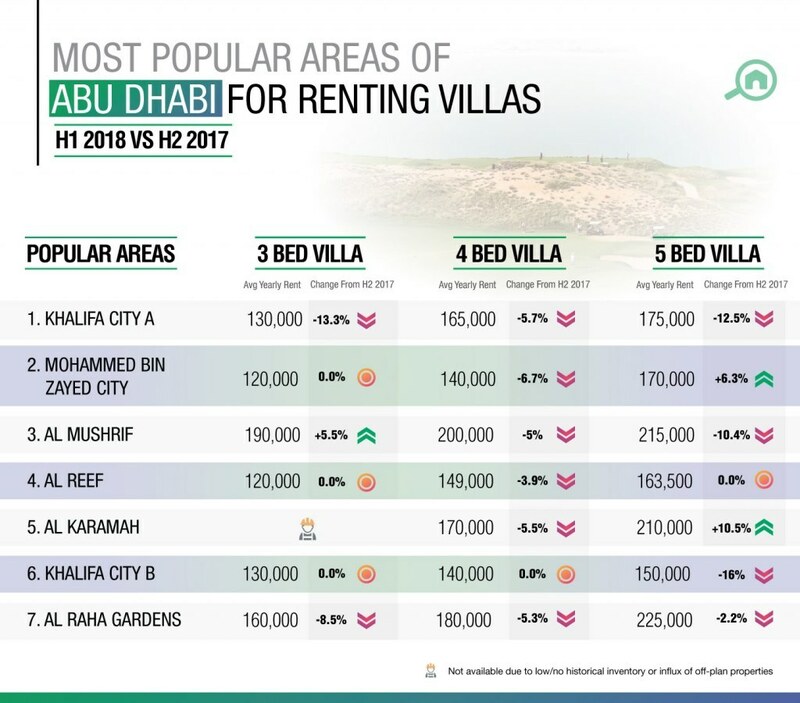 Khalifa City A pipped all other areas to the post when it came to people looking to rent villas in Abu Dhabi in H1 2018. It is easy to see why this pleasant and established residential district is so popular. It is home to the Abu Dhabi Golf Club and the Al Forsan International Sports Resort, providing ample green spaces and leisure options for those living in the area. 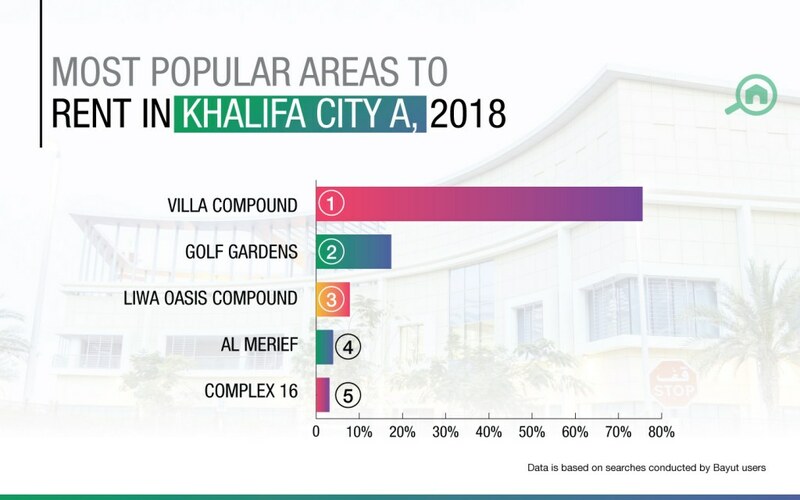 Mohammed bin Zayed City was the second most popular place to rent villas, with Mohammed bin Zayed Centre being the most popular sub-community within that area. Mohammed bin Zayed City was followed by Al Mushrif, Al Reef, Al Karamah, Khalifa City B and Al Raha Gardens in terms of popularity for those looking to rent villas in Abu Dhabi. Most popular areas to rent villas within Khalifa City A, Abu Dhabi. As H2 2018 gets underway, renters may find that villas in Khalifa City A, which were previously out of their reach, are now within budget. Prices for a 3-bed villa fell by 13.34% to AED 130k, 4-beds by 5.71% to AED 165k, and 5-bedroom properties by a substantial 12.5% to AED 175k. Al Reef came out on top for those looking to buy villas in Abu Dhabi: Bayut H1 2018 Abu Dhabi market report. Next on our exploration of property prices in Abu Dhabi is Al Reef, which offers a community of both apartments and villas. 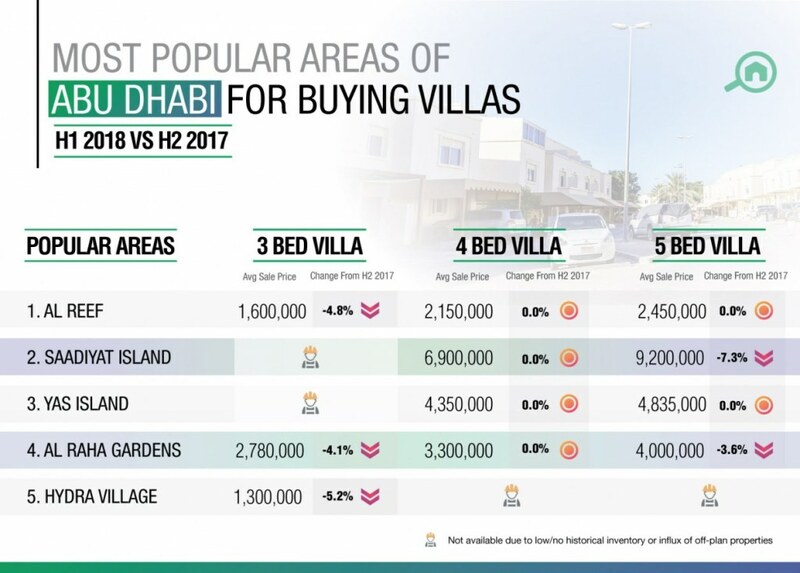 In H1 2018, it was the most popular with those looking to buy villas in Abu Dhabi. The area’s popularity is perhaps the reason behind its relatively stable prices. 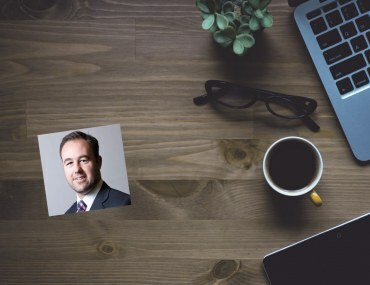 In common with other communities, prices fell, but only marginally so, with minor decreases of 4.72% for a 3-bedroom home to an average of AED 1.6M. The second most popular area for buying villas in Abu Dhabi was the luxurious Saadiyat Island, where the cost of a 4-bed villa reached an average of AED 6.9M, and the price of a 5-bed property fell by 7.3% to AED 9.2M. Saadiyat Island was followed in popularity by the premium areas of Yas Island and Al Raha Gardens, followed by the more affordable Hydra Village, where the average price of a 3-bed villa was AED 3M. In the off-plan segment, there were clear favourites among those looking to buy property with projects in high profile districts receiving a lot of attention. For Al Reem Island, Bayut users were particularly interested in the prestigious Shams Abu Dhabi project. Jawaher Saadiyat was the most popular project for those looking to buy property in Saadiyat Island, while Yas Acres was the most searched for in Yas Island. 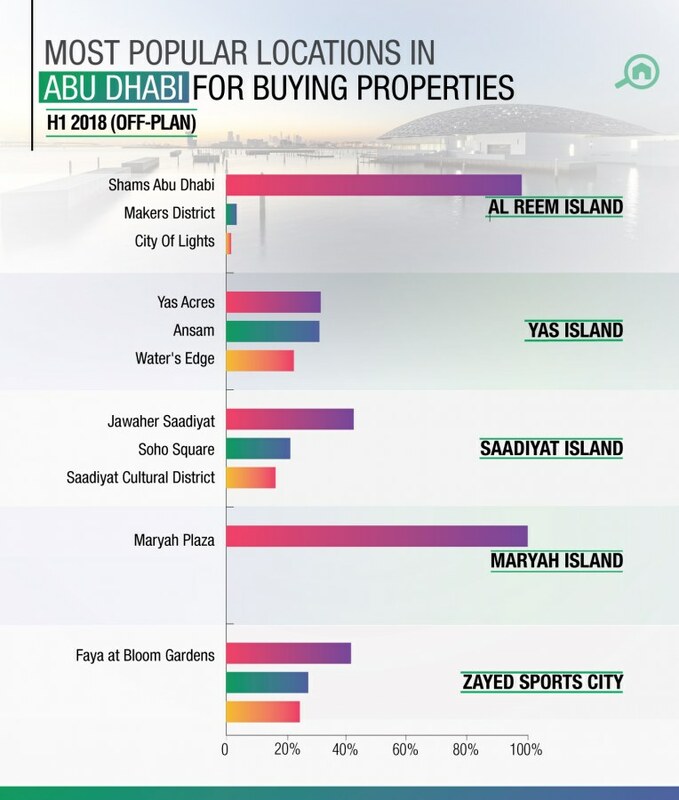 Top off-plan properties for Abu Dhabi in H1 2018. As you can see from our H1 2018 Dubai real estate market report, property prices in Abu Dhabi are behaving in a similar fashion to those in Dubai, falling, but not dramatically so, over the last six months. Stay tuned to the UAE’s best property blog for more information on Abu Dhabi property prices. And let us know in the comments below what your experience of the Abu Dhabi property market is! 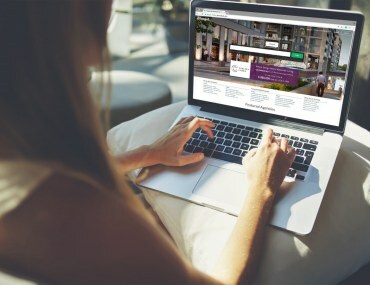 Disclaimer: The above report is based on prices advertised by real estate agencies on behalf of their clients on Bayut.com, and not representative of actual real estate transactions conducted in Abu Dhabi. 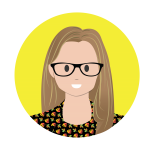 A reformed newspaper journalist, IL loves writing about the UAE, as the speed of change means there is always something new to say. She loves BBC Radio 4, classical music, books and splashing in the sea with her small daughter.